When it comes to learning jazz standards, solos and licks, there isn’t a wrong or right way. But there is the easy way and the better way. The easy way is just to buy some sheet music, read the melody and chords off the page, memorize (or sometimes not) and call it good. That’s certainly the instant gratification way, but I guarantee you that’s not the best way to learn jazz language or any piece of music. Remember that jazz is a language. One of the most important parts of learning a language is mimicking. You hear something and copy it. If you ask almost anybody who is bi-lingual, they will tell you they became fluent by immersing themselves with native speakers and being forced to listen, decipher and respond. Jazz is not music that is meant to be learned from sheet music. It never was. Back in the bebop days in the 1940’s, jazz musicians would pile into clubs and listen to each other play. They would literally pick things up on the bandstand, in rehearsals, and by just listening to records. That doesn’t mean they couldn’t read music, or never read music, but learning music by ear was always the primary method. That’s something I want you to understand. Jazz is first and foremost an aurally learned music. 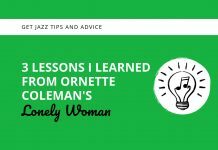 So if you want to become a great jazz improviser, you need to follow in the footsteps of the great jazz musicians before you. 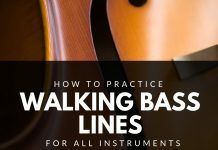 Learning music by ear is not always the easy way, and if you aren’t used to it, you may find it quite difficult at first. But it’s the best way hands down, and the more you do it, the easier it gets. Don’t misunderstand me either. Sheet music is not bad. Can sheet music play a role in your jazz education? Of course, it can. In fact, reading is an important part of learning a language. It can be a great tool to conceptualize and analyze jazz language. It can also be a great resource for checking the work your ear has done. If you’ve gone through the process of learning a jazz standard by ear, you may want to check a chord or two you are unsure about or a piece of the melody that seems ambiguous. In addition, if you’re in a bind and don’t know a tune at a gig, there’s no harm and checking out a chord chart on the fly (although this shouldn’t be abused). The idea is not to throw away sheet music but to know its place. If you truly want to become great jazz improviser, you are going to need to get your face out of the pages and instead open your ears. 1. You will internalize it better. As I’ve already hinted at, learning music by ear tends to be harder for most than reading it. If you’re a competent reader, it’s almost as if the answers are given to you. You don’t have to think as critically. When we use our ears to learn music, we are forced to translate what we hear to our instrument. Along with the struggle of learning jazz from recordings comes repetition. You have to listen to small fragments of music at a time and figure it out on you instrument. This naturally results in many repetitions. In short, the harder you work for it, the more likely you are to remember it. 2. Jazz calls for reaction. Jazz music is based on improvisation. Improvising is one of the core components that makes jazz, jazz. Improvisation is all about reacting and responding to one’s environment. Most of the time you can’t be sure exactly what to expect, but the fundamental idea of improvisation is that you will react to what is happening on a whim. This is where sharpening your ear comes in. Let’s say you are playing a jazz standard and a ii-V-I chord progression is coming up in the form (in the key of C: Dmin7-G7-Cmaj7). But suddenly you hear the piano player approach it chromatically (Ebmin7-Ab7-Dmin7-G7-Cmaj7). What do you do? Do you quickly flip through a recipe book of licks and choose one that fits the scenario? Of course not! There’s no time for that, nor is it in the true spirit of improvisation. Jazz is not predictable. Sheet music is. When we learn jazz language by ear, we are training ourselves to respond to the music with our ear. 3. It helps you become an interpreter. Jazz is not a calculated kind of music. The spirit of improvisation is movement and change. If there are too many rules and limitations attached to the music, the magic begins to wane. In jazz, everyone has a unique voice. We may be trying to say similar things, but ultimately it come out a little bit different. I may play the melody to a song one way, and you may phrase it a little differently. The message is still the same, but we both have a unique way of saying it. I rarely use a piece of sheet music to learn the melody of a jazz standard. The only time I ever take a peek is when I can’t find recordings that play the melody “straight”, which with some research, is not hard to do. And while that can be helpful sometimes, if you learn a melody from sheet music you miss the point. Jazz is about expression. Jazz is about interpretation. When we learn jazz language by ear, we are in sync with the spirit of the music. We are training our ears to respond, and we are internalizing the music so it stays with us. The sheet music is not bad, but it can tempt us to use it as a crutch, not as a tool. The next time you feel lazy, and tempted to reach for some sheet music, stop. Consider the potential of learning the music by ear. I learned to play by ear. I can’t read a note. But thanks to my lottery win in the gene pool and my decades-long, passionate commitment to developing the ability to play what I hear, I’ve held my own on bandstands with some extraordinarily accomplished and even celebrated jazz musicians. I submit that “pure” ear learning is impossible for formally trained musicians. The blood-brain barrier, so to speak, cannot hold. When I play the heads to, say, “Donna Lee” or “Pensativa”, there’s no safety net. So I ask: Would you deliver your hypothesis with equal confidence to players with no formal musical training? Hey Charles, thanks for sharing! To clarify, I'm not saying someone should not learn anything by looking at sheet music. I'm simply saying that if one's first intuition is to learn standard by reading charts, it won't be in their best interest, especially as it pertains to improvisation. Reading, analyzing, and all of that is not necessarily less important, it's just a different skill than learning by ear. I tend to agree with your claim as I can play jazz lines much better after I hear them (played correctly) and internalize the sound. The big problem for me is sight reading and learning them- the swing notations of different breeds just throw me for a loop and I've been trying to do this for 6-7 years. My experience reading music before was as a tuba player or as a singer in classical music. How will I ever get the syncopated jazz rhythms to jump out at me during sight or new reading a tune? Today you can get note for note transcriptions of Coltrane, Monk, Bud Powel, and other great but super difficult Jazz Masters. The Internet makes it possible to find music which would have been impossible to locate just a few years ago. I agree it would be fantastic to learn by ear…. But to tell the truth, l'm in my 70's, and want to learn to play some music I love before I die! Hey Brent inspirational article and surely helpful to improve your ear training. However I wonder – taking your example – how can a beginner identify ( and solo over) a ii V I progression in the first place without having looked at the cheat sheet…. Great advice, and a principle that is not expressed nearly enough in music education. I often say I learned the language of music exactly like I learned my spoken language, that is by ear. I also still use charts for reference, but my ears are what I rely on 99% of the time, on several levels, as you expounded on very well. Not only does it make you a better musician, it makes playing music infinitely more enjoyable. I have a TED talk that touches on a lot of this if you're interested. Totally agree because, although I can read and use those skills to learn a tune, as an old dude from the 40's I already knew the tunes. I basically had a heads up on jazzers born after the 50's. However, I learned to play guitar in the late 50's and concentrated on rock, country and blues until the early 90's; because Jazz is the ultimate challenge in music. If I were a front line musician, I'd agree with this totally. But how does this work when you're a rhythm section player? If I'm a bassist or pianist, other people depend on me to get their harmony/rhythm/groove right. Which means playing what they expect. Which means playing from the real book they're playing against. So is the "you" in the headline of this post a frontline soloist only? Or is it a general post for all jazz learners? Thanks for asking that question! The subject matter is directed to all jazz learners, but it's more about when you're in the practice room learning new material. We're not talking so much about when you're on a gig or jam session. Though its important to have a good repertoire memorized and ready to go for those situations, there are times where using your Real Book is totally appropriate, as I mentioned in the post. But if your question is more directed towards playing the accurate chord changes, as I mentioned you can always check your work against some trusted sheet music (Real Books are not always correct). The process of learning music by ear initially is where the benefit lies. Hope that helps!